It’s hard to imagine this little three-room flat was once home to a family of eight. Flat 3B, Bull Alley Estate on Patrick Street, is a cosy flat comprising of a living room and two bedrooms. It was home to the Molloy family and built by The Iveagh Trust. In 1890, Edward Cecil Guinness, the First Earl of Iveagh and grandson of the original Arthur Guinness, provided houses and amenities for working-class people with low incomes in Dublin. The Iveagh Building replaced some of the worst slum dwellings in Europe. At the time, these new flats were state of the art. Henry and Anne Jane Molloy obtained accommodation with the Trust, settling in 3B in 1915. Their rent was five shillings and sixpence per week. Nellie, their daughter, was one of six children and lived here from 1915 to 2002. Flat 3B, Nellie’s home, is now a museum and unchanged since the trust built Bull Alley Estate. As the flats became vacant, some were modernised. Nellie never wanted it to change, and flat 3B still remains the same to this day. Walking into the flat is like entering a time capsule. Everything is preserved exactly how it was. The living room/kitchen area still has the original range for cooking and heating the flat. The gas lamps remain and even the cups still hang in the press. There was no running water or toilet in the flat. Outside on the landing is a communal sink, bathroom, and storage. When The Iveagh Trust offered to modernise the flat and provide internal bathroom facilities, Nellie always politely declined – deciding to keep it as her family had. Ireland’s religious heritage is evident from the holy statues occupying the corners of each room. 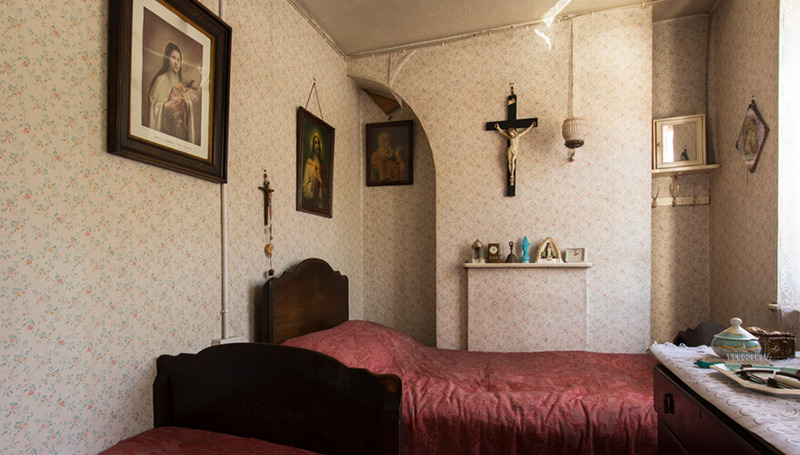 Crosses and holy portraits adorn the walls. Flower-patterned wallpaper and dark wooden furniture fill the house with nostalgia. A standing piano in the living room, the heart of a musical family, was often used for sing-songs and dances in the flat. 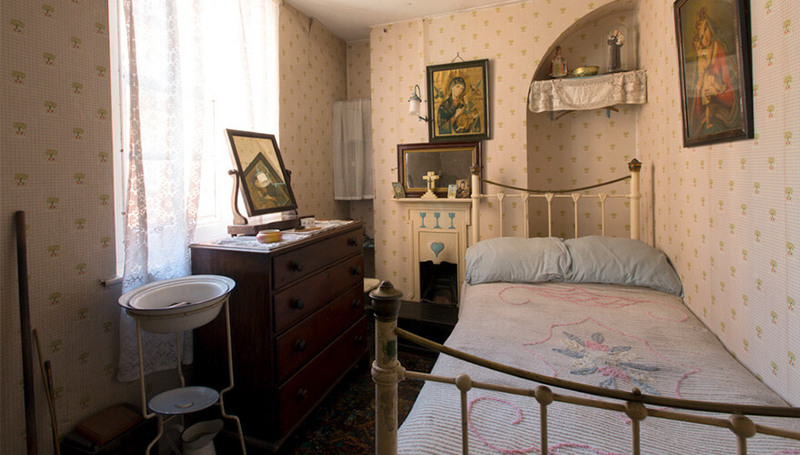 All six children slept in one bedroom, their parents in the second bedroom – an insight into Irish life in the 1900s. The children went to school in Francis Street and went to the ‘Bayno’, a play centre, right in the heart of the Liberties. Its original name was The Iveagh Trust Play Centre and it was also opened by Edward Cecil Guinness. The centre ran activities, including sewing, cooking and education classes and was a place for local children to get a cup of cocoa and a bun. After discovering her skills at the Bayno, Nellie worked for Greenmount Linen Company in Harold’s Cross as a weaver for 27 years. Since Nellie’s passing at 95 years old, flat 3B has been preserved unchanged. 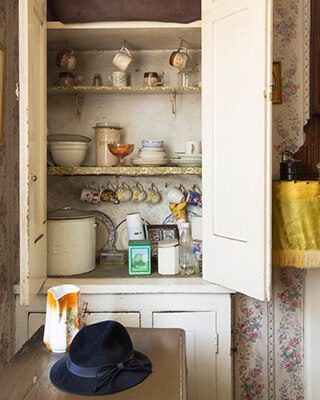 For a nostalgic peek into Ireland’s past, this unique museum flat is a must-see. Visits of the museum flat can be arranged by appointment for small groups.